Is everything "one" or are we just inter-connected without a center? smcj, what is the Rangtong Ma-yin-gag view? Can’t do much now. But it is called, “self-empty, affirming negation”. “Affirming” being the critical term. Last edited by smcj on Tue Jun 26, 2018 12:03 am, edited 1 time in total. I read an excerpt on it just now from the Situ R book you mentioned, and I think you are right in this discussion. One useful perspective that comes to mind, is that the realisation that ‘all beings suffer’ is also a useful way to be able to face up to the reality of suffering. I mean, it is the answer to the question that you sometimes ask when something terrible happens - ‘why me?’ The answer being - ‘why not?’ We’re all in the same boat. SO that actually helps to become less self-centred, and more compassionate; you understand your own suffering is the same as the suffering of others, and the suffering of others is exactly like your own. You're new here. I've had this same discussion with these same people multiple times, minus the Situ R. book referenced in this thread. It's getting really old. But I do kinda like the new "self-empty, affirming negation" idea. It is emptiness put in positive terms, which I think is the important point in Shentong. Plus it avoids the problem of being like Advaita (which I don't care about but is a big deal to some poeple).. Seems pretty cool to me as of this posting. First, being argumentative is inevitable when on the internet, especially when one thinks he or she is going to be the vanguard for Buddhadharma against misinformation. Second, ironically, I don't think they like taking Situ R's words on their own terms. Last edited by Snowbear on Tue Jun 26, 2018 2:41 am, edited 3 times in total. First, being argumentative is inevitable when on the internet, especially when one thinks he or she is going to be the vanguard for Buddhadharma against misinformation. I don't think being argumentative is inevitable. Being argumentative is a choice/attitude. Disagreeing with people may be inevitable. Whether that turns into an argument or not is another thing, but it may without any of the people necessarily being argumentative. Ideally, not really in practice. In any case, I think smcj is right here. created with anything, it has no limitation, it is limitless. nature is limitless, incorruptible, and absolutely forever. Last edited by Snowbear on Tue Jun 26, 2018 3:05 am, edited 1 time in total. Perhaps we are using the term differently. "Interconnectedness" thought as some kind of "interpenetration", where "everything is connected with everything else, at every single point in time and space" is a central theme of the Huayan school of Chinese Buddhism, but, as far as I can tell, this view is rather marginal if you take Buddhism as a whole. I'm not sure I'd say "marginal" although it is primarily an East Asian teaching. There are in fact references to it in Tibetan Buddhism but they are usually indirect. I mean no criticism of Thich Nhat Hahn when I say that a misunderstanding of his teaching on 'Interbeing' has sewn much confusion..on the surface he appears to be supporting the ideas of Advaita. And some do not venture below the surface. What do you have in mind as regard to its presence in Tibetan Buddhism ? I too agree that on the surface Advaita and "interbeing" sound similar. I think that the main difference between "interpenetration" (and, in particular, the Thich Nhat Hanh's version of it, "interbeing") is that in Advaita there is an ontological "primum" that causes everything. Also another important difference is that, in Advaita, at the relative level, there is the Personal Deity "Saguna Brahman". Anyway, "interpenetration" (in its various forms) seems pretty a widespread teaching in East Asian Buddhism. 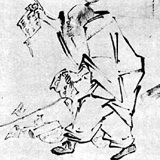 For example, see this article on Tiantai Buddhism on the "Stanford Encyclopedia of Philosophy". there is at least some connection between all beings as taught in Mahayana.both in terms of 'mother sentient beings' and the fact that the clothes on our back, food on our plate, technology were using and so on is due to the kindness and/or efforts of others. Contemplating that samsara has no beginning (SN 15.14) is meant to raise the sense of renunciation, while considering other people's kindness is to develop gratitude (AN 2.31). Neither are about establishing the concept that there is an invisible connection. And the reason for that is that all beings are responsible for their own actions and reap the fruits of their own deeds (MN 135). And what about Metta? Is metta not used to "establish a connection"? One develops kindness in order to attain the 11 benefits (see: AN 11.16), and possibly even liberation (MN 52). Even the four means of attraction (samgrahavastu / 四攝法) are about liberating beings. Yet we can still use the word 'connection' conventionally in the sense that a Bodhisattvas realization and activity is connected or interdependent with the conventional occurrence of sentient beings. Often in Tibetan Buddhism we hear of making 'Dharma connections' with teachers and how students meet good teachers connected by aspirations made in previous lives. Then there are karmic connections and connections established from vows and so on. Then there's the concept of tendrels. So and so is conected with so and so's lineage and so on. Connectivity and interdependence are a fact of reality it's just that on the ultimate side, no entities are truly established. Connectivity and interdependence are a fact of reality it's just that on the ultimate side, no entities are truly established. I'm not talking of any ultimate level, more like "middle level" (conventional analytical/philosophical), that I think the OP is asking about. Of course, connections do make sense on the ordinary conventional level, but that does not require much Buddhist explanation. If we believe in the continuity of mind, then love inconspicuously connects us to the ones we love with continuous positive energy, so that even tangible separations between people who love each other do not reduce the intangible power of love. You can read a nice description of what that might be like for a real master here. May be is it worth pointing that Pratītyasamutpāda does not mean "interconnectedness" but "dependent origination", to chose one translation amongst many. Well said. I think it's easier to understand that shunyata, Emptiness, means nothing has a separate "self" - this doesn't imply that there is a Oneness that has a separate "Self", because nothing does. This goes to the core, anatta, the non-existence of self, anywhere, for anything. TNH's take is that upon seeing deeply every "self" is entirely made up of "non-self" elements. Either way, what's to be taken away from this is that our delusion is in seeing a "Self" where none exists, that our world is made up on many "selves" which if you happen to look at it without self-view, you can't see any of it. Nothing is either self nor non-self. And then who is seeing it? And how do you define "it" ? These are basically oral teachings although sometimes they crop up in print. So they are not direct oral teachings. That is, a lama does not directly say something like "all things are deeply interconnected/interrelated" (actually in Nyingma sometimes a lama does mention deep interrelatedness but this is usually in reference to karma in some way). But they will sometimes mention that karmic influences basically result in deep interconnections over very long time. Sometimes other interconnections are also mentioned. This is not the typical teaching of the East Asian schools wrt what we can call "interbeing/interrelatedness/interconnection" except for some Zen teachers. On both sides the teaching is very subtle. And pretty much only people inclined dharmically to this teaching pick it up (so I am suggesting that there is a specific set of people for whom "interbeing/interrelatedness/interconnection" is natural and one of the perfect teachings in the sense that they respond to it naturally). Last edited by kirtu on Wed Jun 27, 2018 11:20 pm, edited 1 time in total. There is no beginning end or center to anything.